Just a quick hello to let you know I’ll be in New Orleans this weekend for the 2011 International Food Bloggers Conference. For some background on this event, you should check out my recap of last year’s conference (which, by the way, I wrote high on cold medicine). 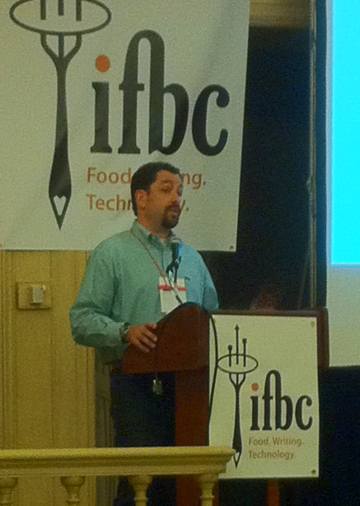 Seen here is Barnaby Dorfman, CEO of Foodista, kicking off the festivities. These guys literally invented the food blogger conference, for which I’ll be forever grateful. The food down here is ridiculously awesome; so don’t be surprised if you see some new Cajun and Creole inspired video recipes in the near future. 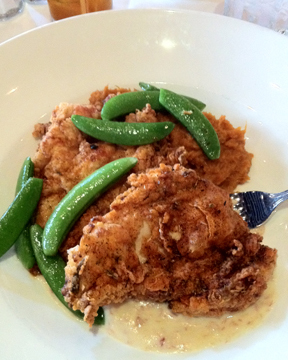 I’ve already had some amazing fried chicken on bourbon-spiked sweet potatoes, and also tempted fate by eating raw oysters in August. My new friend, David Aman, from DocNO Productions, took me out for some oysters and beer at Pascal's Manale, and you can see the visual proof of my culinary courage below. Apparently, it’s fine to eat oysters in the summer, and that old safety warning is leftover from the days before refrigeration, when there was a real danger. I’ve done no independent scientific research, but they tasted fine to me, and I feel great. I’ll be back in San Francisco on Monday. In the meantime, enjoy! In Australia we eat raw oysters all year round. 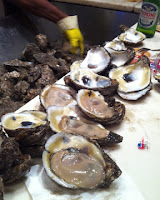 I visited the Sydney Fish Markets (a place a lot of tourists go) and enjoyed a dozen freshly opened mmmmmm. Sorry but that didn't look 2 nice! I love the smell raw oysters produce and I love oyster sauce but when I try to eat them I gag. Tried multiple times, always have to start running to the toilet to puke my guts out. Great to hear you're visiting my fine home town again! I've been a fan of your blog a couple years now and I remember I commented some time ago on one of your creole recipes, that you HAD to visit the city yourself to really experience cajun and creole food. So glad you followed my sage-like advice. Have a wonderful trip and eat yourself silly. Great to hear you've made it back to my fine home town. Ive been a fan of your blog for a couple years now and I remember some time ago I commented on a creole recipe, that you HAD to come visit the city yourself to truly experience cajun and creole cuisine. So glad you followed my sage-like advice. Have a great trip and eat yourself silly. Maybe I'll see you around town! I feel enlightened just watching you eat an oyster. Foodwishesjunkie? I thought oyster season was months that contain an "R" ... have I been misspelling my birth month my whole life? I was born in Arugust? I never knew my father was a pirate. Chef John you just changed my whole life. How am I going to tell my Grandkids they're part pirate? Chef John I just thought of this; you should get an app developed for the iPhone and Android phones! That would be so cool and convenient to cook from our phones and tablets :). @Tech Titan ... are you sure you want your expensive electronic devices in the kitchen ... around all those various kinds of fluids and oils? I know how clumsy I can be, and there's no way I'm taking that kind of chance! I have had Food Wishes video running (and pausing, then running again) on my dinning room table as I attempted to produce some of Chef John's dishes.